He has an amazing amount of education and teaching experience. Fred received a BA in biology at Northridge State University and a MS in biology and education at the university of Chicago. I love that campus! After which he taught science in Bakersfield and Pacific high schools in the late 60s. He then taught Ecology and Natural history at UCSC where he also served as Program Coordinator of biology and environmental studies for USCS extension. And because he felt the need for more education, he earned a PhD form SC Paideia where he worked with Page Smith on San Lorenzo River restoration and human ecology. He still continues to teach UCSC environmental studies, natural history and field study classes at the San Lorenzo River and SC Mountains. 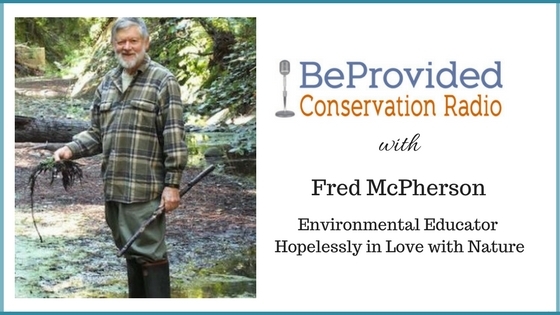 Fred is also an organizer for the SC Mountains Institute and is a Board Member of the SC Mountains Bioregional Council. Listen in on the bonus audio for the sounds of various birds living in the Santa Cruz Mountains Redwoods!